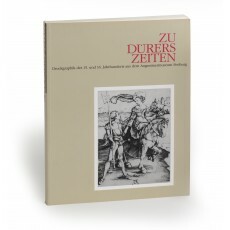 (28 cm), 256 pp., 207 illustrations. Publisher’s pictorial wrappers. - Catalogue of an exhibition of 174 15th and 16th century prints by Dürer, Baldung Grien, Aldegrever, Wolgemut, Schongauer, Altdorfer, and many others. Includes essays by Sybille Bock (on printmaking in Dürer’s time), Michael Bachmann (on the iconography of the first rider of the Apocalypse), Ines Heim (on the 16th century German prayerbook, Hortulus animae), and Thomas Schwarz (on the woodcut illustrations to Johannes Meyer’s Altväter and Johann Geiler von Kayserberg’s Granatapfel). ¶ Very good, unmarked copy.